Phonetics deals with how human speech sounds are produced. It studies the nature of sound in human speech. Free flow of air is needed in order for you to produce a speech sound. This air usually flows outward but also flows inward. The air that flows inward is called Ingressive Air while the air that flows outward is called Egressive Air. These are organs that contain the air for speech production. For one to be able to speak, air in motion is needed and the respiratory organs contain this air. Air passes from the lungs---trachea---larynx---pharynx---oral cavity(mouth)---nasal cavity(nose). All these are the respiratory organs that aid speech production. These are organs responsible for voice production. Phonation means voice production. These organs include the larynx and its contents. The larynx houses the vocal folds (vocal cords), which are essential for phonation. The vocal folds are situated just below where the tract of the pharynx splits into the trachea and the oesophagus. 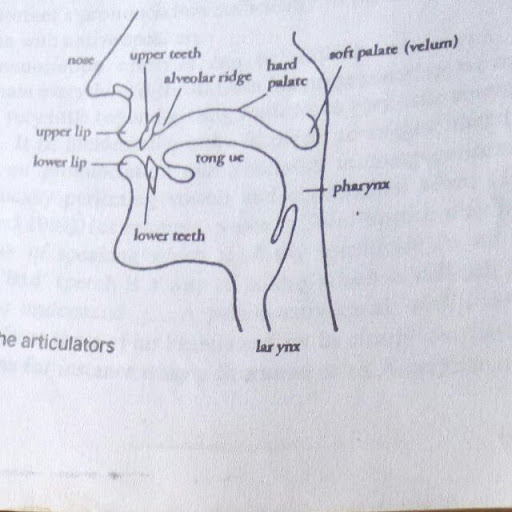 The diagram above shows the articulators (i.e. the organs that come together to produce speech sound). You will need to look at it carefully as the articulators are described, and I will advise you have a mirror and a good light placed so that you can look at the inside of your mouth. The oral cavity (mouth) and the nasal cavity (nose) are connected and where they meet is known as the pharynx.They are connected in the sense that the top of the pharynx is divided in two; one part being the back of the mouth and the other being the beginning of the way through the nasal cavity(nose). The pharynx is a tube which begins just above the larynx. You can see the back of the pharynx if you look in your mirror with your mouth open. The larynx is known as the voice box. The larynx houses the vocal folds (vocal cords), which are essential for phonation. The vocal folds are situated just below where the tract of the pharynx splits into the trachea and the oesophagus. The soft palate or velum is seen in the diagram in a position that allows air to pass through the nose and through the mouth. It is always in this position but during speech production, it is raised so that air cannot escape through the nose. When the sounds k and g are produced, the tongue is in contact with the lower side of the velum. The teeth comprises the upper teeth and the lower teeth. It is in front of the mouth, immediately behind the lips. The tongue is important in speech production; it can be moved into different parts and different shapes. It has different parts or subdivisions: tip, blade, front, back and root. The alveolar ridge is behind the upper teeth. It is between the top front teeth and the hard palate. You can understand this by pronouncing the sounds: t and d. The place where the tip of your tongue touches while pronouncing these sounds (t and d) is the alveolar ridge. Its surface is really much rougher than it feels and is covered with little ridges. The lips (upper lip and lower lip)are very important in speech production. They are pressed together when sounds like p and b are produced. They are brought into contact with the teeth when sounds like f and v are produced. The eight articulators described above are very important in speech production. 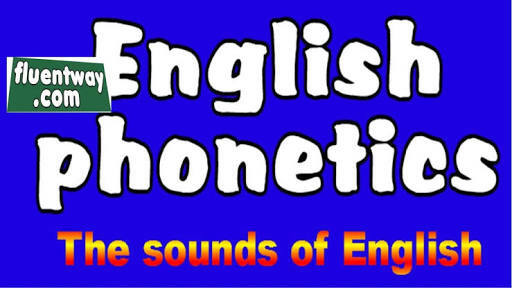 This is just an introduction for you to really understand phonetics (how sounds are produced). In our next tutorial, I shall be discussing The English Phonemes (consonants and vowels). Try not to miss any part of this tutorial. Use the comment box for questions and clarifications.